Whether it’s a winter storm, a tornado, or the remote possibility of some form of terrorist attack, you need to be prepared. Taking the time to store food and water supplies now will help provide for your family if an event occurs. We provide the City of Brecksville and the communities around us Fire, EMS, and Rescue services. We also provide many non-emergency services that include public education in CPR classes, tours of the station, fire extinguisher demonstrations for businesses, juvenile fire setters programs, lectures to all types of group gatherings and Safety Town plus many more programs upon request. Fire Inspections are also a service that we perform to ensure the safety of all businesses in town. The Fire Inspectors also review and approve plans for fire suppression systems and life safety issues that are proposed in new building plans. Water is the most important item in the event of an emergency. The average active person needs to drink at least 2 quarts of water per day. Nursing mothers, children and ill people require more. You should store one gallon of water per day for each person in your household. A two-week supply for each person should provide you with an ample supply of water. If water runs low, you should not ration, it is better to find water from other sources. You can minimize the amount of water your body needs by reducing your activity and staying cool. Water should be stored in clean, plastic or glass containers. Plastic containers such as soft drink or milk containers are best. Water containers should be tightly sealed, labeled and stored in a cool dark place. Water can remain potable up to six months but should be changed at that time. Finding emergency water sources in the home: If caught by surprise do you know where to find water within your home? It can be found in the following areas: Hot water tank–Make sure the gas and electricity are turned off and open the drain at the bottom of the tank. Start the flow of water by turning off the water intake valve and turning on a hot-water faucet. Do not turn on gas and electricity when the tank is empty. Since minerals such as rust tend to accumulate at the bottom of the tank let water run until it is clear. Pipes–You can use the water in your pipes by letting air into the plumbing by turning on the faucet in your house at the highest level. A small amount of water will trickle out. Then obtain water from the lowest faucet in the house. As a last resort, you can use the reservoir tank of your toilet. Do not use the toilet bowl. In the event of a water main or sewer line break find the incoming main water valve that supplies your home. You will need to shut it off to prevent contaminated water from entering your home. If water becomes contaminated boiling is the safest method of purifying. Bring water to a rolling boil for 3-5 minutes. Let the water cool before drinking. You should purify all water of uncertain purity before drinking it. A flash flood from a broken dam or levee or after intense rainfall of one inch (or more) per hour often catches people unprepared. The rule for being safe is simple: head for the high ground and stay away from the water. Even a shallow depth of fast-moving flood water produces more force than most people imagine. The most dangerous thing you can do is try walking, swimming, or driving through such swift water. More people lose their lives in floods than in any other weather-related event. 80% of flood deaths occur in vehicles, and most happen when drivers make a single, fatal mistake - trying to navigate through flood waters. DO NOT DRIVE THROUGH FLOODED AREAS! Even if it looks shallow enough to cross. Water only six inches deep can sweep a person off their feet. Water a foot deep can displace a 1500lb. vehicle! Two feet of water can easily carry most vehicles! Most trucks, four-wheel drives, and sport utility vehicles also are susceptible to being swept away by high water. Such vehicles often give motorists a false sense of security, believing the vehicles are safe under any conditions. If a vehicle stalls, leave it immediately and seek higher ground. Rapidly rising water may engulf the vehicle and its occupants and sweep them away. Remember it’s better to be wet than dead! Water covered roads conceal other damage as well. Manhole covers may be off or sink holes may have been eroded which could easily cause harm. If you have to walk in water, walk where the water is not moving. Use a stick to check the firmness of the ground in front of you. If you must prepare to evacuate your home bring in outdoor furniture and turn off utilities at the main switches or valves if instructed. Disconnect electrical appliances. Do not touch electrical equipment if you are wet or standing in water. DO NOT TOUCH ELECTRICAL EQUIPMENT IF YOU ARE WET OR STANDING IN WATER. 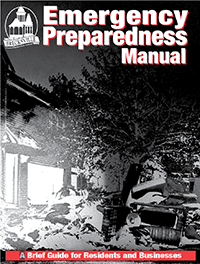 Prepare a family disaster plan. Check to see if you have insurance that covers flooding. If not, find out how to get flood insurance. Keep insurance policies, documents, and other valuables in a safe-deposit box. Assemble a disaster supplies kit containing: first aid kit and essential medications. Canned food and a can opener. At least three gallons of water per person. Protective clothing, rainwear and bedding or sleeping bags. Battery-powered radio, flashlight and extra batteries. Special items for infants, elderly or disabled family members. Also identify where you could go if told to evacuate. have several places….a friend’s home in another town, a motel or a shelter. Q: Can I buy flood insurance? A: Yes, the City of Brecksville is in compliance with the National Flood Insurance Program which means that residents can buy flood insurance. Q: Must I live in the flood plain to buy flood insurance? A: No, you do not have to live in the flood plain to buy flood insurance and those who do not live in the flood plain may have lower rates for coverage. Q: How do I buy flood insurance? A: The best way to buy flood insurance is through your local insurance agent. Should your agent not be informed regarding this coverage they can contact the National Flood Insurance Program for information. Healthy people can survive on half the usual food intake for an extended period of time. Food may be rationed, unlike water, except for babies and pregnant women. Avoid foods that are high in fat and protein and don’t stock salty foods. Stick with familiar foods, such as canned or dry foods that require no preparation. Also, keep family members with special nutritional needs in mind. Make sure you have a manual can opener and disposable utensils on hand. If you need to cook food when the power goes out the fireplace can be used or a charcoal grill or camp stoves can be used outdoors. Chafing dishes, candle warmers and fondue pots can be used indoors but exercise extreme caution. If you are interested in learning more about how to prepare for emergencies, contact the American Red Cross Emergency Services at (216) 431-3010.